Usher the new lunar year of the Goat with a great bang by celebrating the occasion with your family, friends or even business associates at Dorsett Hospitality International’s hotels. 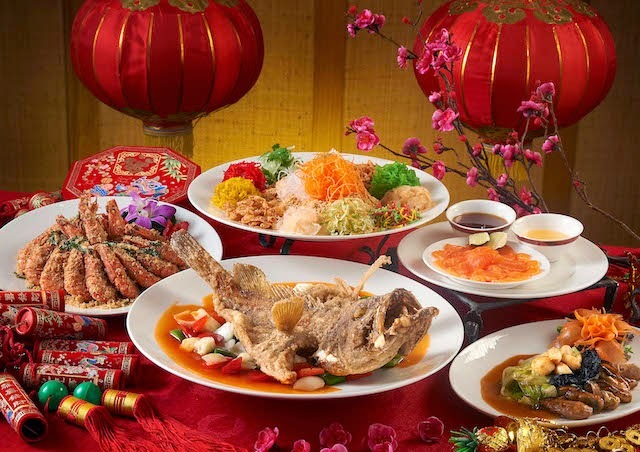 Between 1 February - 1 March 2015, the award winning restaurants at Dorsett Grand Subang, Dorsett Grand Labuan, Dorsett Kuala Lumpur, Silka Maytower Kuala Lumpur, Silka Cheras Kuala Lumpur and Silka Johor Bahru will be offering authentic Chinese New Year gastronomies such as ‘Salmon Yee Sang,’ ‘Snow Pear Yee Sang,’ ‘Vegetarian Yee Sang’ and other fares to toss with you to greater prosperity and success this year. 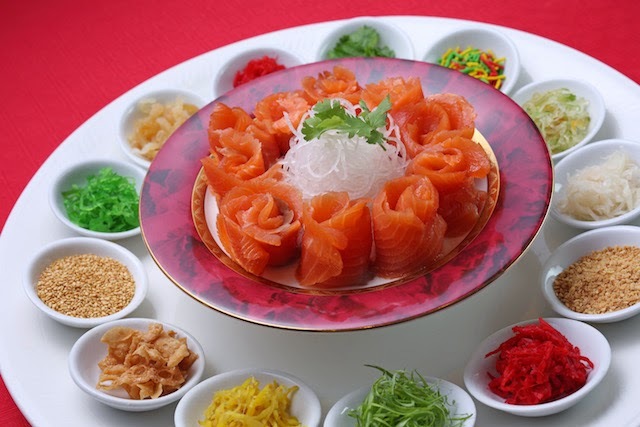 At Dorsett Grand Subang, enjoy Free ½ portion of ‘Salmon Yee Sang’ with minimum spend of RM588++ at The Emperor. The Emperor’s Reunion Set Dinner is available at RM98.80++ per person from 1 February to 5 March 2015. Terraza Brasserie’s Buffet Dinner. RM108++ per person. Available from 19 & 20 February 2015. ‘Salmon Yee Sang’ will be available from 19 February to 5 March 2015 at RM98++ per portion. Contact Dorsett Grand Subang at +603 5031 6060 for more information. At Dorsett Grand Labuan, save 10% off total beverage bill spend on a single receipt from 15 February to 5 March 2015. Reunion Buffet Dinner is available from 18 February at RM88 nett (Adult) RM62 nett (Children). Gong Xi Fa Chai Prosperity BBQ Buffet Dinner, available from 19 February 2015 onwards. RM99 nett (Adult) RM69 nett (Children). Contact Dorsett Grand Labuan at +6087 402 775 for more information. At Dorsett Kuala Lumpur, enjoy Free ½ portion ‘Snow Pear Yee Sang’ from 18 February to 5 March with minimum spend of RM338++ on a single receipt at Checker’s Café. Contact Dorsett Kuala Lumpur at +603 2716 1000 for more information. At Silka Cheras Kuala Lumpur, save 18% off total F&B bill spend on a single receipt at Curvz Café on the next visit with every purchase of Yee Sang. 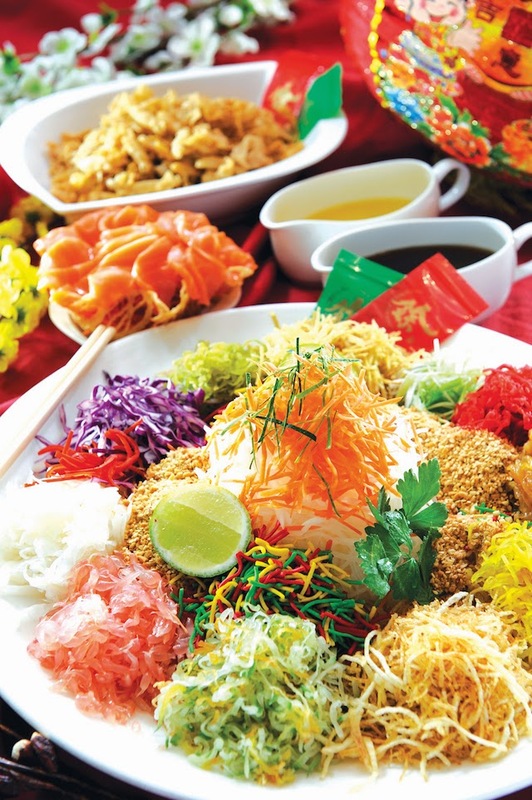 Priced from RM68nett per portion of Yee Sang (serves 5 – 6 persons). 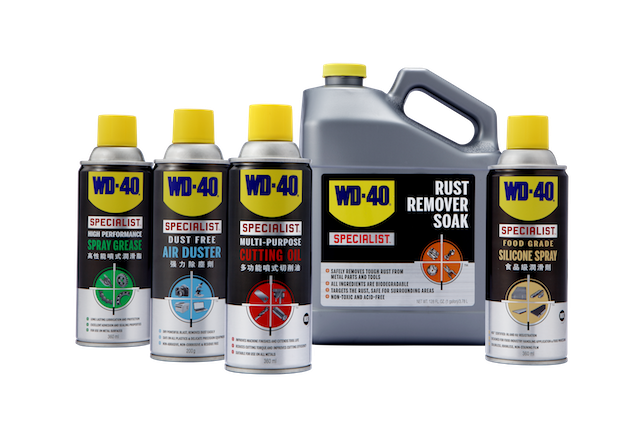 Available from 1 February to 1 March 2015. Contact Silka Cheras Kuala Lumpur at +603 9100 1133 for more information. At Silka Johor Bahru. Free Vegetarian Yee Sang (serves 5 persons) with every ‘Salmon Yee Sang’ ordered. Valid for dine-in and takeaway. 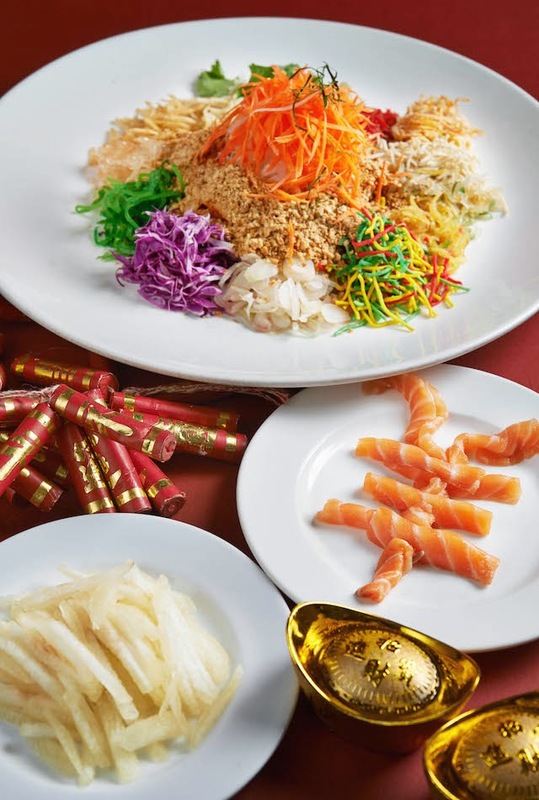 ‘Salmon Yee Sang’ dinner priced at RM388++ for 10 persons. 18 February to 1 March 2015. Contact Silka Johor Bahru at +607 360 1061 for more information. At Silka Maytower Kuala Lumpur. The 10th diner will be Free when you book for a table of Steamboat Dinner for 10 persons. RM23++ per person. Available from 28 January to 18 February 2015. Contact Silka Maytower Hotel Kuala Lumpur at +603 2692 9298 for more information. For other Chinese New Year gastronomic offers, please visit www.dorsett.com. Just another sharing from one of the many emails I get daily. For a good cause, check out what Nu Lifestyle is doing in collaboration with the Malaysian Red Crescent Society in OPS Banjir. 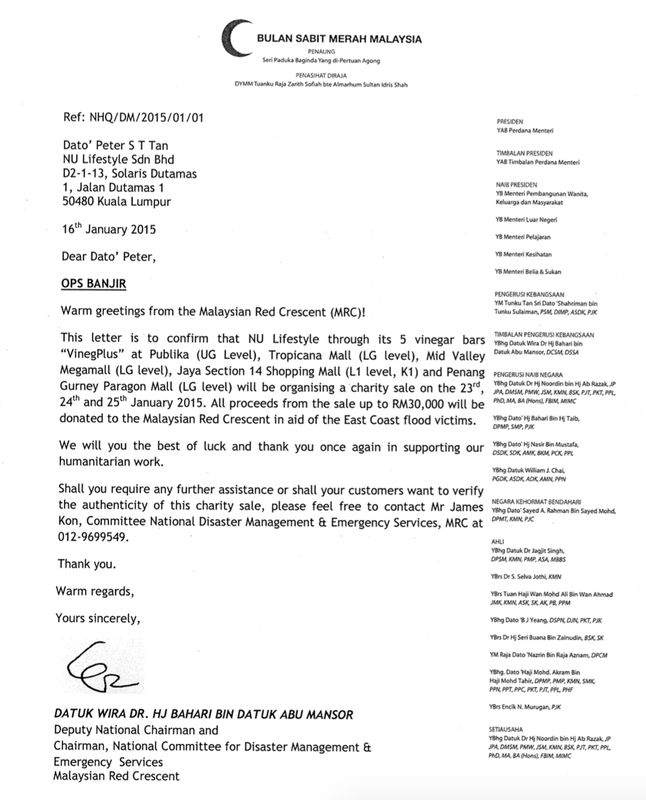 Nu Lifestyle Sdn Bhd is working with Malaysian Red Crescent Society to provide monetary support to the national rehabilitation program. Nu Lifestyle, known for its vinegar kiosks called VinegPlus, will be holding a 3-day charity sales from 23 to 25 January, where 100% of the proceeds will go to flood victims via Malaysian Red Crescent Society. Nu Lifestyle, through VinegPlus Kiosks, aims to raise no less than RM30,000 for the cause.